A campaign to raise awareness of "car-dooring" is needed to save lives on Britain's roads, Cycling UK has said. 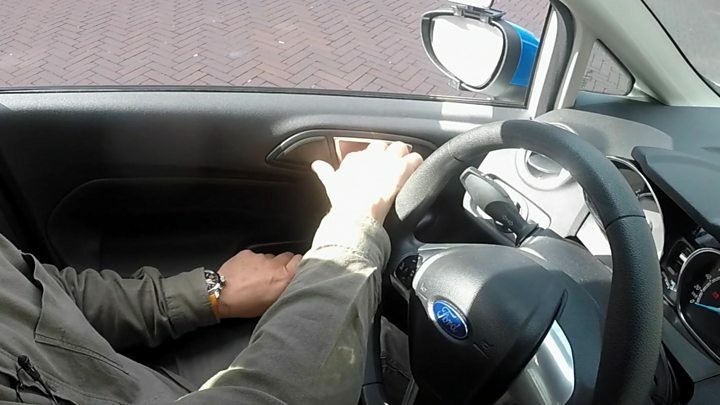 It wants the Dutch reach - which involves opening doors with the "wrong" hand - to be taught to new drivers. The Department for Transport says it will consider new messages on cycle safety as part of its Think! campaign. Three of these had been travelling in cars - five were cyclists knocked off their bikes. Do you have to be slim to wear Lycra? In total 3,108 people were reported hurt but Cycling UK believes the true figure is probably much higher. It's suggesting an information campaign, warning cyclists to ride further into the carriageway, to avoid the swing of car doors. It also wants higher fines for careless door opening. And it's urging ministers to have the "Dutch reach" taught in driving tests. This manoeuvre involves the driver or passenger on the right-hand side of the car opening the door with the left hand - forcing them to turn and see if anyone's approaching. It's a mandatory part of Dutch driving tests. A video of the technique has been seen by more than a million people on the "Outside" magazine website. The idea has been supported by Cambridgeshire Police and Crime Commissioner Jason Ablewhite, who said: "This simple step seems like a good way of checking that a cyclist is not approaching and reducing the risk of 'dooring', particularly in a congested city." The Department for Transport previously dismissed the proposal - but that was just after the Transport Secretary Chris Grayling was filmed having knocked a cyclist off his bike opening a car door. Mr Grayling apologised to the cyclist who he said was not badly hurt. Dramatic footage posted on YouTube shows Olukayode Ibrahim colliding with a car door in London on a Sunday afternoon in September last year. "I was heading to work in Leicester Square. The cars on the road ahead had been stopped by a traffic light and I rode up beside them. "All of a sudden, the passenger door of a VW Golf opened directly in front of me. There was nothing I could do but to brace for the worst as my mind almost blanked," Mr Ibrahim said. "The impact came in seconds and resulted in me slamming into the inside of the car door while at the same time landing almost on top of the passenger who was exiting the car. "Initially I was trapped as the brake lever punctured the upholstery of the car door and got stuck while the cleats on my pedals didn't disengage immediately. "With the help of sympathisers, I was able to free myself and my bike. The owner of the car accepted liability. "During the course of discussing the incident with the VW owner, I voiced my displeasure at the reckless manner in which the car door had been opened. "I sustained a sprained left wrist which was painful for a couple of months. "The worst part of the experience was the knowledge of what was about to happen when the car door opened and knowing that there is nothing I could do about it and the fact that I didn't know what would be on the other side" he added. Cycling UK is hoping that the new minister, Jesse Norman - a keen cyclist - will take a broader look at cycle safety in the light of the incident in which young mother Kim Briggs was killed by a cyclist on an illegal bike. The group says all road users should be given better protection from the reckless acts of others. Car-dooring will enter the spotlight on 22 September at Leicester Crown Court when it hears an appeal over the death of Sam Boulton. He was a schoolteacher who died when he was knocked into the path of a van after being hit by a taxi passenger door. The passenger, Mandy Chapple, pleaded guilty and was fined £80, but the driver, Farook Yusuf Bhikhu, is appealing against conviction: he says he didn't give permission for the door to be opened. The maximum fine for car-dooring is £1,000 - even if the victim is killed as a result. Cycling UK says the fine does not reflect the seriousness of the offence. Mr Boulton's father, Jeff, said: "It's heart-breaking that an offence which has ended a life and caused untold trauma for my family be treated so lightly under current legislation. "Until we have an appropriate offence in law, I call on the government to start investigating how they can better educate and train drivers about the dangers of car-dooring." AA president Edmund King told BBC News he supported any campaign to improve safety between cars and bikes. He said the AA was still handing out wing mirror "Think Bike" stickers to jog drivers' attention. "It's a good idea to get cyclists better educated too," he said. "It's much safer cycling some way into the road because if you cycle next to the kerb you've got car doors to worry about and you're much more likely to have to swerve to avoid a pothole or a dropped manhole cover." Mr King said driving instructors for BSM and the AA already typically taught the opposite hand door-opening method. A government source, commenting on the proposal for teaching the Dutch reach, suggested ministers might be unwilling to prescribe a manoeuvre that would be ridiculed in parts of the media - but suggested that cycle safety groups might make more headway on this matter themselves. A spokesman for the DfT told BBC News: "From 2012-2015, Think! worked in partnership with Transport for London to extend their cycle safety 'tips' to cyclists and motorists in other cities. "This included the advice to 'Always check for cyclists when you open your car door'. "In 2016, Think! launched a new cycle safety campaign targeting commuter cyclists and HGV drivers."